Every woman wants to look slimmer and younger. Strong figure and youth can be achieved with regular exercise, but how can you handle cellulite, which does not always rest for most women? The benefits of massage in the fight against cellulite know a lot, but not everyone knows that to accelerate the positive effect can be by means of honey. To do this, you need to take a natural, not sugary honey and rub it through the skin in the skin for 7-10 minutes. To increase the effect of honey, you can mix it with aromatic oils (eucalyptus, lemon, juniper, lavender, etc.). For one massage of the hips and buttocks you will need about 2 teaspoons of a mixture of honey with aromatic oils. Let’s describe more about the procedure of honey massage: honey mixture put on your palms hands and gently sprinkle your hands through the problem area. Thus, part of the mixture will be on the skin, and the rest will remain on the hands. If you need to massage in several areas, first massage one area and then move on to the next. When the honey mixture is completely transferred to the massaged area, apply a little effort to the massage area and sharply tear your hands off the surface of the body. Do this procedure repeatedly, reinforcing the pressure with each passing time and cutting off more sharply palms from the body. The procedure should be continued for about 10 minutes at intervals every other day. 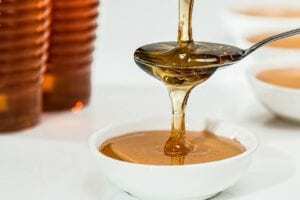 Next, it is necessary to rinse honey from the surface of the body with a soft washcloth so as not to cause skin irritation and apply a moisturizing lotion or cream. One anti-cellulite course includes about 10-15 sessions of massage. Initially, the procedure may seem a bit painful, and women with excessively tender skin can even detect bruises that go after the first few procedures when the skin surface adapts. Application of oils and honey can cause some allergic reactions, it is recommended that a honey procedure be performed by a specialist. In addition to honey, a positive effect in the fight against cellulite deposits can be achieved with the help of sea salt. To do this, it is necessary to stir about 12.35 oz of sea salt in a warm bath, the temperature of water in which will be 95-95 °F. Such a bath will help not only get rid of cellulite, but also calm the body and nerves after a tiring working day. Be beautiful and remember that only attention to oneself and peace help women to be eternally young. Previous PostPrevious Is It Healthy to Eat Eggs Every Day?